In the post-game press conference on Saturday after Kentucky’s 88-61 win over Utah, John Calipari said that Rick Pitino needs to come back to Lexington and be honored by UK fans. Congrats 93 UK team! Proud of you guys and love the hell out of you. Thx Cal for reaching out. Much appreciated. I always knew that while Pitino was at Louisville, he would never get any sort of applause. He would just be met with loud boo’s. But now with Pitino out of coaching and not having been in Rupp Arena since 2015, can we all be respectful and honor the man for what he did while he was at Kentucky? Let’s look at both sides. In 1989, Kentucky was put on three years of probation for recruiting and academic violations while Eddie Sutton was here. They also banned Eric Manuel from NCAA competition and banned Chris Mills from Kentucky. This banned Kentucky from post-season competition in 1990-91 and from televised games in-season. UK was also limited to 3 scholarships per year and had to return the $350,000 gained from their appearance in the 1988 NCAA Tournament. Basically (at the time) the hammer. In the summer of ’89, C.M. Newton, who was in his first year as UK A.D., hired Pitino, who was coming off his job with the New York Knicks. In his career, Pitino went 219-50 (81%) with 3 Final Fours and won the title in 1996. He brought Kentucky back from rock bottom and did something most coaches couldn’t have done. We aren’t where we are as a basketball program without Pitino. No, because he coached Louisville, flipped us off, he’s a traitor, etc. In the summer of 1997, after Kentucky’s title game loss, Pitino jumped ship and went to the NBA to coach the Celtics. Then in 2001, Pitino did something most Kentucky fans have never forgiven for, took the Louisville job. In Pitino’s time at Louisville, he went 420-143 (74%), with 1 Final Four (2012 Final Four, 2013 title, and 123 wins vacated). In 2015, Louisville travelled to Rupp Arena and lost 75-73. This game happened right when the Katina Powell allegations were occurring. 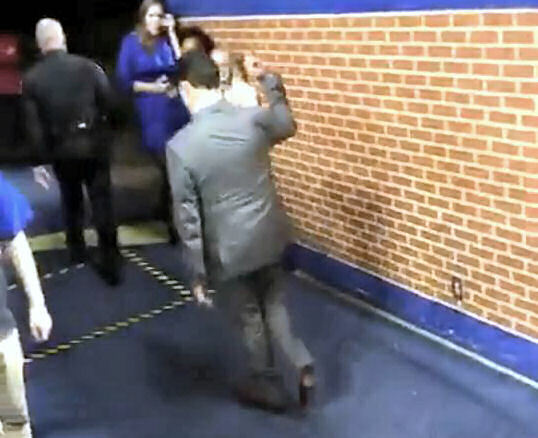 When Pitino walked to the tunnel, he flipped us UK fans the bird as you saw in the picture above. He hasn’t been back to Rupp since. 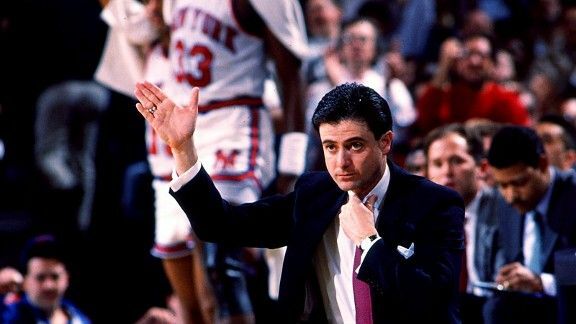 With both cases being made, I think Pitino should be honored for the 30th anniversary of the 1992 “Unforgettables” team. He did so much at Kentucky and put our rival in the grave. The anniversary for the ’92 team would take place sometime in 2022, which is four years from now and when this would happen. Make it happen. Next ›Jarren Williams to transfer to Kentucky?